The Mixed Marvel Arts Podcast crew is proud to kick off their Amazing Fantasy Comic Book League. What does that mean you say? Well I’m glad you asked. The AFCBL is a year-long challenge to determine who can draft a better team of superheroes. If you’re a fan of Fantasy Baseball, Football, Hockey or Curling (I don’t think there is a Fantasy Curling League, but maybe there should be! ), and you enjoy following your favorite hero as (s)he dukes it out and saves the day in your comics, then the Amazing Fantasy Comic Book League is right up your alley. On a monthly basis, participants will take turns drafting or dropping heroes based on how the player thinks the hero will perform in the upcoming month. Based on a set of seven categories, the drafted heroes will accumulate points for their team, and at the end of the year, a winner will be crowned based on the team’s overall score. It’s basically math combined with superheroes, what’s not to love? Appearances – The player gets a point every time their drafted hero shows up in a comic. It has to be a meaningful appearance, not necessarily with dialogue, but it can’t just be a headshot or a shape shifter posing as the selected hero. 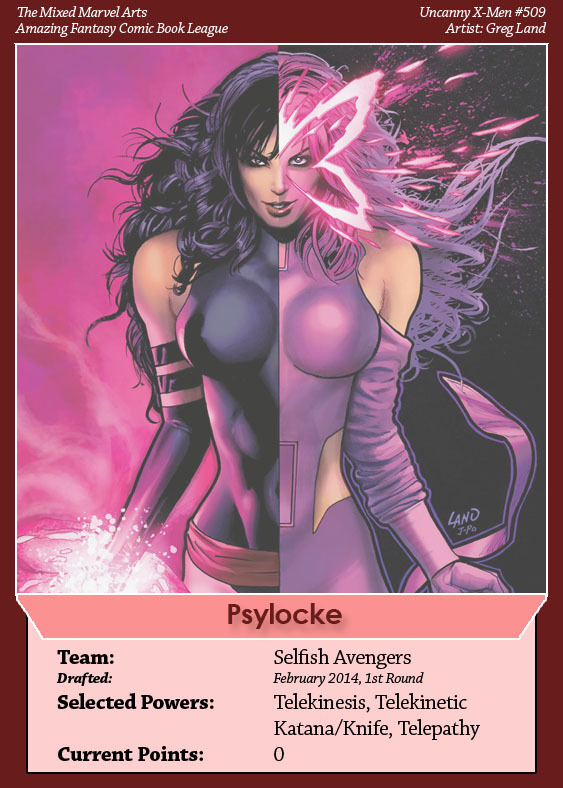 Use of Power – This will be one of the most hotly debated categories when determining points considering the wide array of power sets some characters possess. 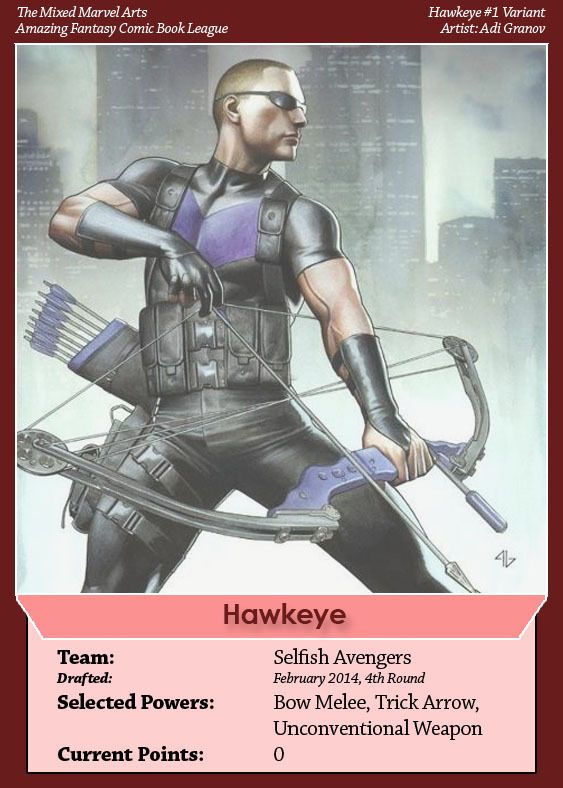 Therefore, to limit the potential headaches this category may cause, upon drafting a hero, the player must pick three powers for which they can receive credit. For example, if Player A drafts Storm, they can select lightning strike, gust of wind, and ice storm. Therefore, any time Storm calls down a bolt of lightning to attack an antagonist, or uses hail to pelt a group of bad guys, she secures a point for her team. These powers have to be used in a meaningful way (e.g., against a villain, or to help a fellow hero or teammate) in order to get credit. 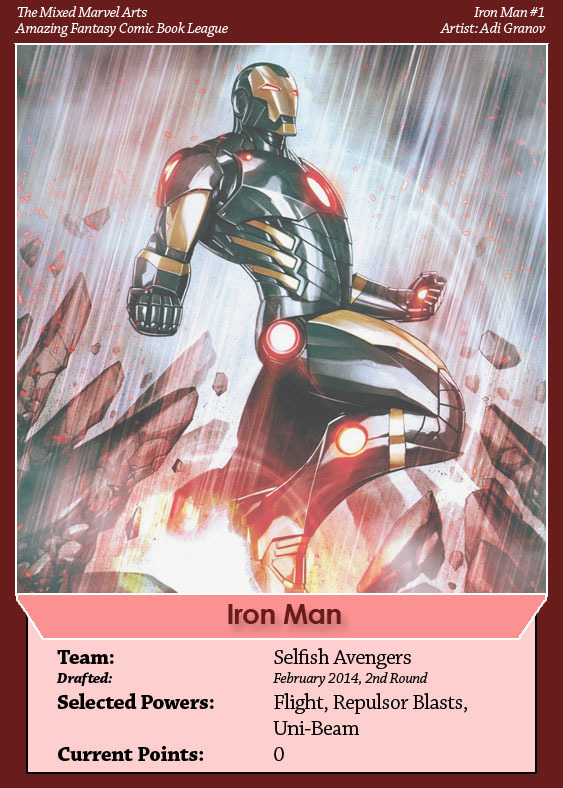 Another caveat of this category is that the hero will not get a point for passive abilities like flight, unless that power is actually used in a heroic manner, such as crashing their body into the bad guy to save the day while flying. Character Development – Has the character returned from the dead, died, lost a signature power, met the love of their life, or maybe just given up on crime fighting? Then you get a point. If a life-changing event happens in the comic for your hero, you get a point. This change must have a strong impact on the character as a whole. Simply changing a costume would not count. Team-up – If there’s one thing the heroes like to do, it’s to tag team their problems with other tight-wearing do-gooders. If your hero teams up with another hero, you get a point. The team up has to occur outside of any sort of team affiliations. Therefore Storm and Wolverine do not get team up credit for appearing in an X-Men comic together. If Storm shows up in a Spider-Man comic, she and Spider-Man receive points since that is not a common occurrence. Leading a Team – For those heroes that are habitual team joiners, team-ups may not happen very often. That way, in order to get credit for their camaraderie, if a selected hero leads the charge into battle, they will be credited for a point. If Storm rallies the X-Men around her and leads them into big conflict, she gets a point, regardless of whether they win or lose. For those less brave, brainier heroes, formulating the plan that saves the day will also count as leading the team. Established leaders, such as Captain America or Cyclops, will not get credit for just showing up, however. Saving a Civilian – The heroes wouldn’t be heroes if they didn’t swoop in every now and then to save a random stranger caught in a bind. This category is where the hero gets credit for helping out poor, lowly Mr. Johnny Everyman that happen to be in the streets when the violence erupted. Since the non-powered sheep tend to huddle in groups, Saving a Civilian counts as groups of civilians as well. The civilians must be seen being rescued and helped on page, and not the hypothetical “well he saved the world from blowing up, so he gets credit for saving civilians.” That instance would be covered in our last category. Defeating the Villain – One of the truest ways to determine a successful hero is how he handles taking down the bad guy. 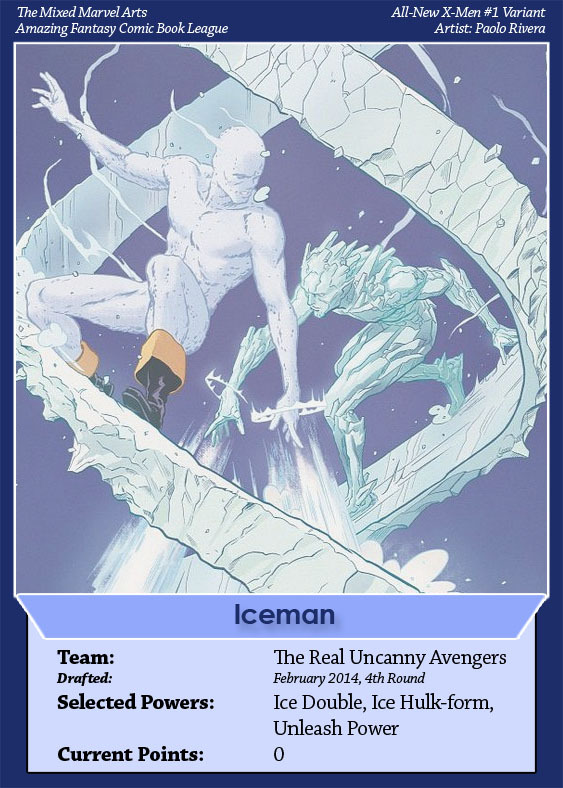 If the hero is responsible for thwarting the dastardly plan to melt the polar ice caps, or helps place their foe in handcuffs, you get credit. But if Dr. Doom decides he just doesn’t want to play, takes his ball and goes home on his own volition, no soup for you! Also, a henchman does not qualify as a villain, so stopping a simple bank robbery would not fly, but it could potentially count as Saving a Civilian if there were any pedestrians seen in imminent danger during the robbery. So with the categories laid out, and probably not completely, clearly defined, the MMA Podcast drafted their first teams. Starting Wednesday, February 5, Brian and Shaun’s respective heroes and teams will begin racking up points as the new comics hit the shelves. 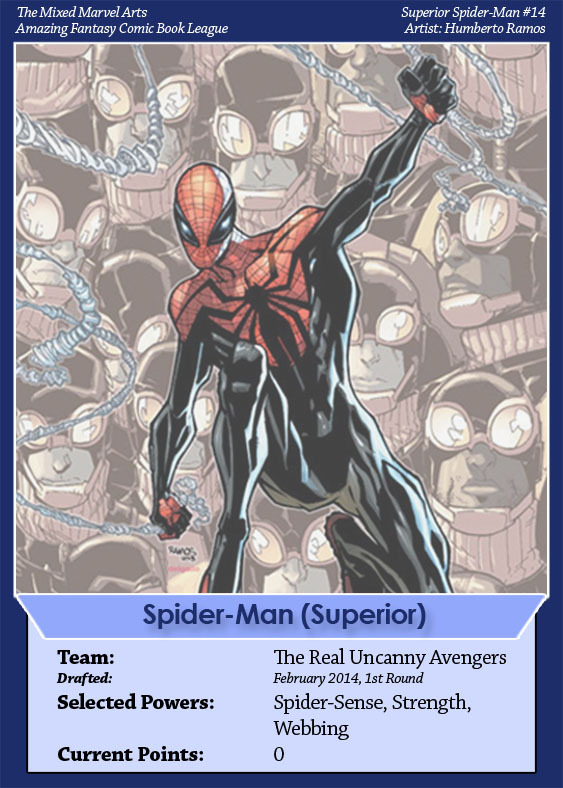 Also of note, heroes drafted also follow specific rules, namely alternate universe or timeline characters of the same name do not count when drafting the main 616 character. To start the league off simple and small, Brian and Shaun each drafted four heroes, ideally making it easier to keep track of all the appearances their characters will potentially make. The goal of the league is to encourage feedback and discussion, both on the site and on the podcast, so comments and requests to join or help tally points are most welcome. And now, without further ado, here are the two starting teams for the MMA Podcast’s Amazing Fantasy Comic Book League. Join us every week as we tally the latest points… and I’ll just leave this picture here for now! The Mixed Marvel Arts Podcast is in no way associated with, or endorsed by, Marvel Entertainment, LLC. The Mixed Marvel Arts Twitter! The Mixed Marvel Arts Facebook!